Eiffel In Seoul: Who Wore Fendi Better? Huang Yi vs. Lisa S.
Who Wore Fendi Better? Huang Yi vs. Lisa S.
Huang Yi (黄奕) attended the press conference of basketball film, 'Amazing (神奇)' held in Shanghai, China on June 15, 2012. The Chinese actress wore an embellished dress from Fendi Pre Fall 2012 collection, styling her look with a pair of black tights and patent pumps. 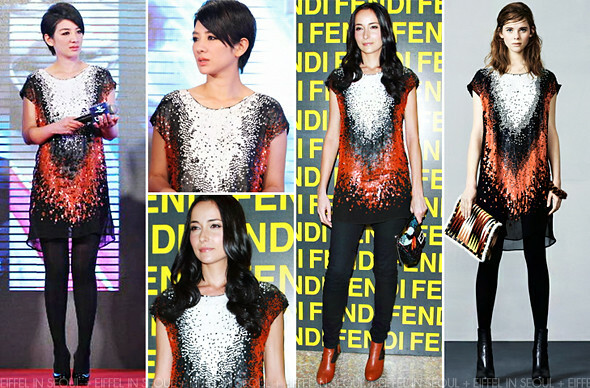 Model, Lisa S. was also seen wearing the same dress to Fendi 'The Whispered Italian Grand Tour' exhibition held at Landmark Atrium on June 23, 2012. She accessorized her look with a pair of black denim, brown boots and a Fendi 'Baguette' bag. Definitely prefer the dress on Huang Yi (黄奕). I dislike the boots and denim on Lisa S..